Weekly Reflection: Eat, Pray… Teach? Last Sunday I was in one of those funks we fall into when we think things aren’t quite coming to plan. ZOMG what am I back at university again? What on earth am I doing writing about it on the internet? I’m never going get a job. 24 hours later I got a phone call that changed everything. My first reaction was actually shock, followed by jubilation, relief and a bit sadness for the roads not taken. Because this journey has been a long one. Last June I decided I needed a holiday from life, quit my job and booked a one-way ticket to the States with no real idea of where I was going. Frustrated, bored and lacking in direction I needed to do something better, the problem was that I wasn’t sure what that something was. So I went off in search of it. Yes I realize this is sounding like the plot of Eat, Pray, Love. I remember reading the book while I was travelling last year. I didn’t love it, I didn’t hate it either, but I understood why other people did like it, was stoked that others found it was inspirational, and moved on. I was shocked by the huge backlash against Elizabeth Gilbert once the movie came out: her book advance paid for her travels, the plot was superficial self-absorbed chick lit at the worst, she was not a serious person. Which is amazing given the Gilbert’s previous success and the brilliant TED Talk she gave on nurturing creativity. But the point of the book is that sometimes you need to lose everything to find something. And about this time last year I was having one of those bad travelling days. My wallet had been stolen, I’d dropped my camera, it was cold, I was hungry but that day it didn’t matter because if you can’t tell from the photo I found myself here. 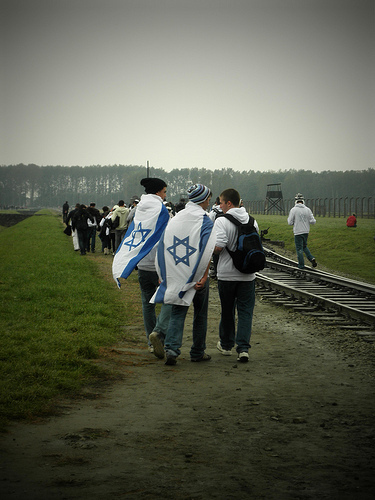 I found myself transfixed by the Israeli teenagers walking the groups of Auschwitz with flags draped with defiance, I don’t know, but they were there learning. We were there learning. So that brief moment is part of the reason I’m off Wellington to teach next year. Yes I sound like a bit like an aimless wanderer but not all those who wander are aimless. Even if we end up with some crazy looking maps out of the process. How Twitter helped me land my first teaching job!